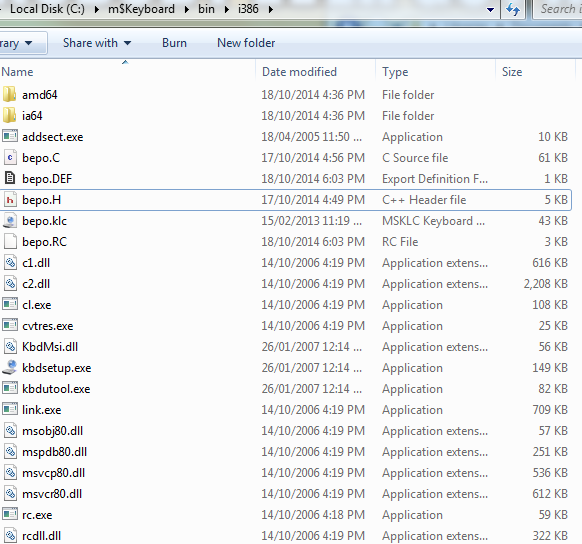 I'm trying to run the Microsoft Keyboard Layout Creator to create dll files for the Bépo keyboard. Compiling layout information from 'bepo.klc' for wow64. bepo.H : can't open for write. bepo.C : can't open for write. The warnings about not being able to open the files for writing are expected, I was following a guide here (in French). I added this folder to the system path, so I'm not sure what the problem is. If it's of any relevance, cl.exe reports itself to be a 32-bit C/C++ compiler for 80x86. I am using Windows 7 x64. The keyboard tool supports building DLLs for 64-bit targets. It doesn't matter if I change the case of bepo.C to bepo.c, the same problems occur. You can see I moved the folder from its installation location, suspicious that it might have something to do with spaces in the path. I have all aspects of .NET 3.5 enabled. Browse other questions tagged c++ filepath keyboard-layout cl or ask your own question.